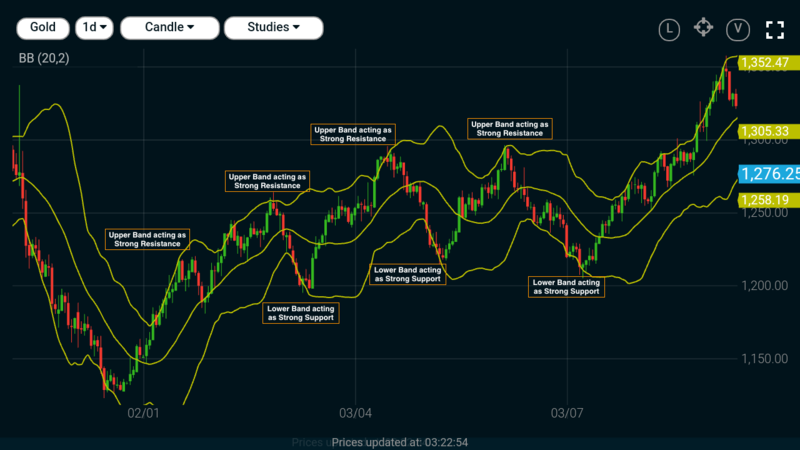 After learning about basics of Bollinger Bands in the previous Market Vidhya lesson (How to trade using Bollinger Bands), we will now learn about various trading strategies using BB. The ‘M’ pattern commonly known as the double top when used with BB can add more accuracy. This formation occurs when prices are repelled twice by the top band. It indicates that market has exhausted as there is a shift from buyers to sellers and price might fall till the bottom band. Double top formation marks the beginning of a Downtrend. The ‘W’ pattern commonly known as the double bottom when used with BB can add more accuracy. This formation occurs when prices drop to the bottom band twice and then are repelled upwards. It indicates beginning of an uptrend as the downward pressure reduces with a shift from sellers to buyers. Double bottom formation marks the beginning of an Uptrend. In the above hourly chart of Euro, there is a ‘W’ pattern seen with a double bottom. Firstly the price crosses the lower band and makes a low at 1.2770. Then it retraces to the middle band (1.2830) and falls back to the lower band (1.2780) . However, price holds on to the lower band and does not fall beyond it losing its downside momentum. Finally the price rallies from here with consecutive strong bullish candles, confirming the Double bottom formation. The BB squeeze occurs when the price movement contracts to a narrow range. This strategy helps traders to gauge the initiation of an upcoming big move. How to trade using BB squeeze? 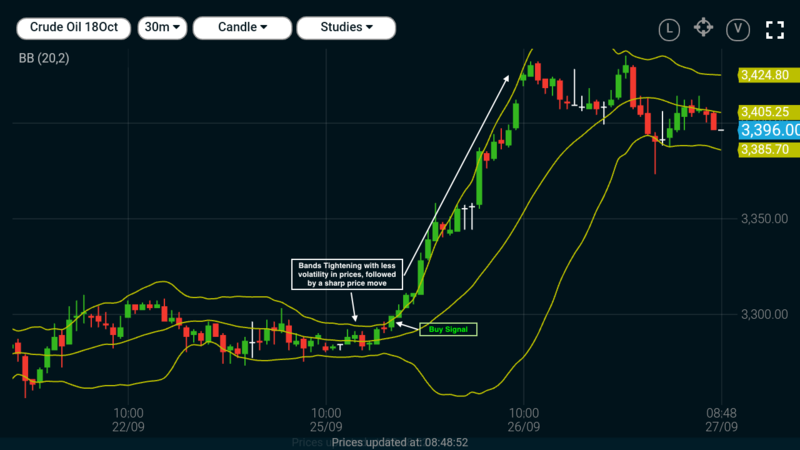 In the above 30 min chart of MCX crude oil, BBs squeeze with sideways movement in price indicating period of low volatility. A Buy signal is then generated with prices crossing and closing above the upper band which is then followed by a big rally upwards. When prices break the upper band, an “over-bought” signal is generated and when prices break the lower band “over-sold” signal is generated. Both are recognised as Reversal Signals. If the stock price gaps up through its upper band limit and the candle closes near its low still completely outside the upper band. A Sell signal is generated indicating that the stock will correct (fall) in near term. If the stock price gaps down through its lower band limit and the candle closes near its high still completely outside the lower band. A Buy signal is generated indicating that the stock will rise in the near term. Traders must look for opportunities to trade within the bands and strongly follow the trend. बोलिंजर बैंड स्क्वीज़ का उपयोग कैसे करें?